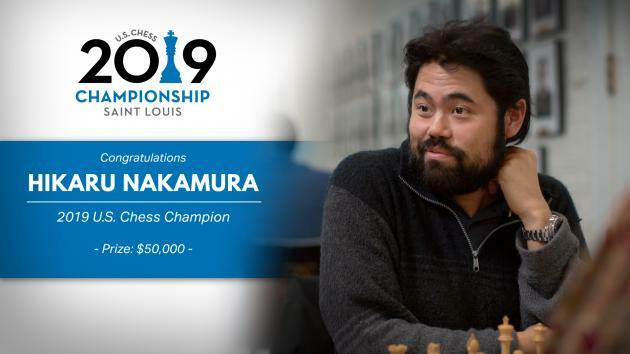 GM Hikaru Nakamura defeated GM Jeffery Xiong to win the 2019 U.S. Championship outright. All images courtesy Saint Louis Chess Club. When the top four players all think a round is "must-win" then that's a good sign for the man who actually does. And so it was for GM Hikaru Nakamura in today's final round of the 2019 U.S. Championship. Thinking that other players with a share of the lead might bag the full point, he pulled yet another rabbit out of the hat by playing the Dutch to land young GM Jeffery Xiong in unfamiliar waters. Hikaru Nakamura checks up on the games while awaiting for his title to become official. Photo: Lennart Ootes/Saint Louis Chess Club. It worked, he won, and he has now jumped above such legendary players like GM Yasser Seirawan and GM Alex Shabalov who both have four lifetime titles. It also pulled him equal with longtime national team partner GM Gata Kamsky, who also has five. GM Leinier Dominguez seemed to be in the catbird's seat before the day's play began. He was the only one of the trio on 7.0/10 with white, and he played one of the lower-rated players (GM Timur Gareev). However just like in their first matchup at the 2006 Olympiad, Gareev showed resourcefulness and today engineered a wickedly frustrating piece-down but drawn ending. The eventual champion didn't think much of Timur Gareev's chances against Leinier Dominguez, but he "came through" for Nakamura. Photo: Lennart Ootes/Saint Louis Chess Club. GM Fabiano Caruana, the last player with a share of the pre-round lead, tried to be provocative but couldn't even get any drama as Black against outgoing champion GM Sam Shankland. They drew without issue. GM Wesley So held out very slim hopes of catching the leaders, but he even lost today against the tournament's youngest player, GM Awonder Liang, who made 2600 with the win. There was some "edge of your seat" action today, but not the right kind for Wesley So. Photo: Lennart Ootes/Saint Louis Chess Club. With the women's championship already decided yesterday, you can just hit copy+paste from most of the other round reports. WGM Jennifer Yu won again, even though the title was already hers. She finished with 10.0/11 and won by a shocking 2.5 points. Nakamura simply put himself in the best position possible to get a real game. Although he spent most of the night checking 1. e4, Xiong's usual starter, today out came 1. d4. Nakamura resorted to the same "must-win" salvo that Caruana used successful a day ago: the Dutch Defense. With three Americans fighting tooth and nail for the #uschesschamps title, in the end it's anyway the Dutch that clinches it! Still, he had to wait a bit on the victory. Just because his rook invaded the a-file didn't mean that White would go quietly. "Jeffery found these very interesting tactics instead of just losing like I thought he would.” After Nakamura's win, he had to pause again, waiting for the final moves of a dead-drawn ending in Dominguez-Gareev. When they shook hands, Nakamura's fifth title was in hand. Sam Shankland, the outgoing champ, watches the final critical game to officially pass the crown to Hikaru Nakamura. Photo: Lennart Ootes/Saint Louis Chess Club. "This one was really different because I had so many games that I thought were must-win," Nakamura said. "Just finding a way to win these games with Black was very special." He said that two things kept him focused for much of the event. First, he recalled a slow start at the 2006 championship where he nearly rallied to win the title but came up just short in the final game. The moniker is passed with a congratulatory handshake. Photo: Lennart Ootes/Saint Louis Chess Club. He also reiterated what he told Chess.com from a few days ago: the support from his many Twitch followers and subscribers motivated him. To hear more about that an other thoughts on this title, here's a video interview conducted with Nakamura. So, is he done at five? Nakamura wouldn't make any such bold predictions. Dominguez looked like he would force a Monday playoff, but Gareev, who Nakamura gave merely a 20 percent chance of not losing, found one "only move" after another to enter an unlikely drawn ending despite being down a knight. Gareev's shirt might look thrift store but his defense was Neiman Marcus. Photo: Lennart Ootes/Saint Louis Chess Club. While Dominguez flirted with some winning chances, Caruana didn't get much of an opportunity to equal Nakamura. He said his opening choice was "borderline bad" but intentionally provocative. There was just one problem – Shankland wasn't provoked. Rustam Kasimdzhanov and Fabiano Caruana conjured a rope-a-dope opening idea, but Shankland didn't feel like punching. Photo: Justin Keller/Saint Louis Chess Club. What about trotting out the Dutch again, like he did previously and which Nakamura used successfully today? Caruana thought the rabbit was already out of the bag. With Shankland's final few hours left of being the title-holder, he reflected on the past year. He said that being U.S. Champion was the "greatest honor of his life" and he is thinking about taking the next few months to write a sequel to his acclaimed book on pawn moves, "Small Steps to Giant Improvement." In the women's event, a few notable results stand out. GM Irina Krush ended the tournament just like she started, with a win (although she said she wanted to forget the middle). Curiously, she still finishes in the top half despite a minus score (5.0/11). IM Anna Zatonskih lost again, today to WGM Sabina Foisor, which allowed WGM Tatev Abrahamyan to catch for former for second. But if you wanted the news of the day, you already had it most of the other rounds of the tournament: Yu won again. You might think there's no training for playing a game with 9.0/10 and with a tournament already clinched, but no, if there's anyone in the field read for such an experience, it was Yu. In 2014, she also ran up 9.0/10 at the World Youth Girls U-12, and clinched gold with a round to go. There's little doubt that Caruana's 8.5/10 at the 2014 Sinquefueld Cup was the best single performance ever in St. Louis, but now you can also make a big argument that Jennifer Yu just turned in the best women's performance ever here. Photo: Lennart Ootes/Saint Louis Chess Club. She won her final round back then, just like she did today. That's class. Yu said she went into the game with the same mindset as any other round, but now, her mind needs a rest. “I think I need a little break after 11 rounds plus the seven rounds before it at [high school] nationals,” she said. Her next goal is to make IM. Like Abrahamyan, both have the three norms. It will just be a matter of who gets to 2400 first (Abrahamyan came very close earlier in this event). Note that Abrahamyan won the second and final World Cup spot on the fourth tiebreak. Here's the full broadcast from today's final round.